UNE students in Screen Studies will recognise a familiar face in the cast of the new six-part ABC/Netflix political thriller Pine Gap, which premieres on Sunday night. Lecturer Lewis Fitz-Gerald plays Rudi Fox, a career CIA officer serving as the Chief of Intelligence at Pine Gap, the Joint Defence Facility in remote Central Australia. 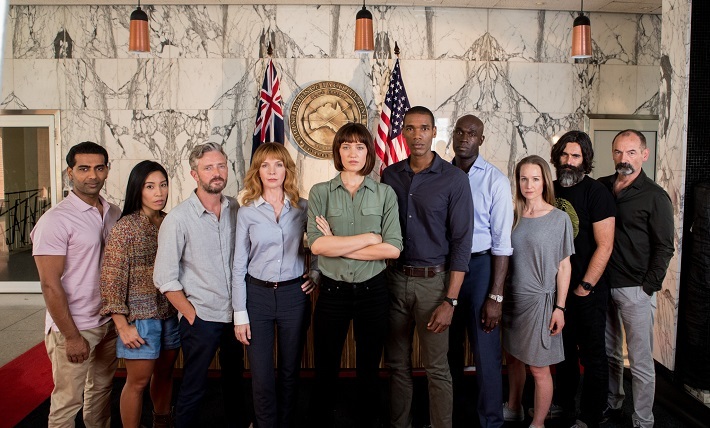 "The series delves into the secretive world of intelligence and explores the US-Australian defence relationship," said the experienced actor, director and screenwriter. Lewis joined UNE as a Sydney-based part-time lecturer in 2017 after completing both his Masters and PhD (in film practice) with us. He still enjoys occasional visits to Armidale and says he hopes that his continuing film and television work directly benefits students. "The things I teach are the things I do for a living - documentary film-making, Australian screen and Hollywood cinema - and I think it helps to keep students abreast of current industrial and creative practice in our rapidly changing global mediascape," Lewis said. "The forging of new commercial and creative partnerships - like Netflix partnering with the ABC on Pine Gap - is happening at what sometimes feels like breakneck speed. "Emerging students will be far more academically (and industrially) literate than my generation. And while I’m very fortunate to continue working professionally, I value the opportunity to apply that experience academically and to teach what I am passionate about." So, after attending screenings of Pine Gap in Sydney and at the Adelaide Film Festival, Lewis will be back doing what most other lecturers are doing right now - marking essays.